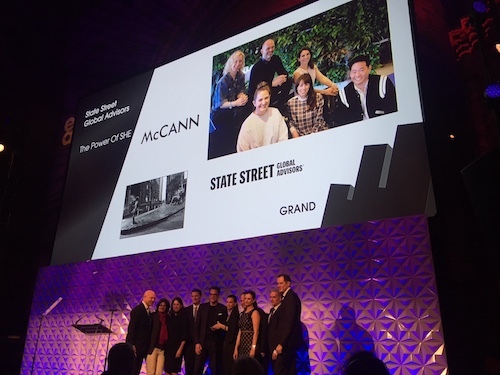 New York (May 31, 2018) – The Power of SHE aka “Fearless Girl” campaign from McCann New York and State Street Global Advisors was presented with the Grand Effie trophy (best in show) at the 2018 North American Effie Awards Gala held on May 31 in NYC. The rankings for the most effective marketers were also revealed at the end of the gala. Since 1968, the Effie Awards have honored marketing ideas that work. The most effective marketer and brand coming out of the 2018 North American Effie Awards competition is State Street Global Advisors. Additional highest ranking companies include: IPG (holding group), McCann Worldgroup (agency network), McCann New York (agency office) and Droga5 (independent agency). “The Grand Effie jury interrogated the Fearless Girl entry and found that, not only was it effective for State Street’s business and brand, it was effective because of its creative power,” said Nick Law, Co-Chair of the Grand Effie Jury and Chief Creative Officer of Publicis Groupe and President, Publicis Communications. The North American Effie rankings reflect points accumulated from finalist and winning case studies from the 2018 North American Effie Awards competition and will be factored into the 2019 Global Effie Index. Global Effie Award winners were also recognized at the gala for the year’s most effective marketing ideas that worked in multiple markets worldwide. Gold Global Effies were awarded to TBWA\Media Arts Lab and Apple for “The Rock X Siri” (with contributing agency OMD) and Johannes Leonardo and adidas for “Original is Never Finished” for adidas Originals. Winning and finalist North American and Global Effie case studies are rigorously examined, debated and evaluated by seasoned industry leaders over at least two rounds of judging. A complete list of Gold, Silver and Bronze winners for the North American Effie Awards, as well as the opportunity to read the winning case studies, is available on www.effie.org.